Antique Kerman Ravar Rug Pictorial – Turco Persian Rug Company Inc. 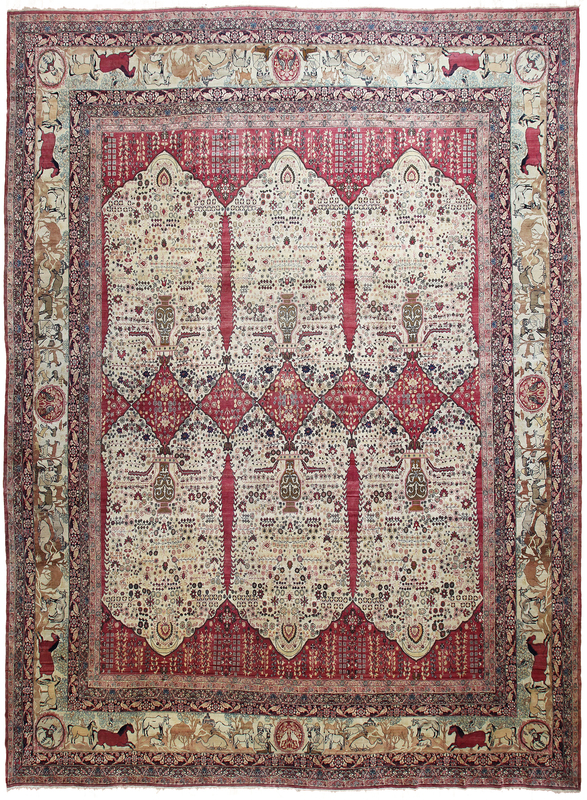 This rare beautifully preserved Antique Persian Kerman Ravar rug (circa 1890) is in very good condition. Its main boarder is a pictorial of a landscaped filled with animals such as cows, horses, camels, goats, deer, and boar. The inner and outer borders are filled with birds in a repeating pattern. The corners of the main border contain caricatures of King Lotf Ali Khan. Lotf Ali Khan reigned in Persia from 1789 – 1794 which defines the Zand Dynasty and was considered the last Shah of Persia. His reign was marked with many battles and hardships against the armies of Agha Mohammad Khan of the Qajar Dynasty who eventually defeated Lotf Ali Khan and took the throne in 1796. Legend has it that Lotf Ali Khan fought 14 men single-handedly for two full hours before falling. Lotf Ali Khan was known for his courage and inspiring other nobles and their armies to fight alongside him in battle. A British author who knew Lotf Ali Khan is quoted to have said that he was “the last chivalrous figure among the kings of Persia”. Actual Size 14' 12" x 19' 12"